Our son asked for a Transformers party for his eighth birthday. After looking on the internet for hours and not finding a design I liked and thought I could do, I came up with this design. This was a 9×13″ white cake iced with white buttercream icing. Several people I had talked to said that fondant did not taste very good and was very difficult to use. With that in mind I experimented with different things for the Transformers face until I decided to use my grandmother’s Potato Candy recipe (minus the peanut butter). First I cut a circle out a piece of paper as a pattern to shield the cake and then sprinkled black sugar crystals in the center of the circle. For the face I boiled a small peeled potato. After it cooled I mashed about a half dollar sized piece of the potato and started blending in powdered sugar until it made a stiff dough, usually at least one box of powdered sugar will be needed (the starch in the potato will melt the sugar until enough has been added). I then dyed it with red icing tint and rolled it onto a piece of wax paper. Using a pattern from a coloring book I cut out the pieces. You will need to work quickly as the candy starts to crack if handled too much. I placed the pieces on the black circle then piped the buttercream icing to do the words and design around the bottom of the cake. For my first attempt at this kind of cake decorating it was a huge success. Although it was a simple design everyone loved it. I made this Transformers cake for my son’s seventh birthday. He absolutely loves Transformers and so I thought it would be fun to surprise him with a transformers cake. His birthday was on a Saturday so I baked the cake in 12 inch rounds on the Thursday before and froze them. The cake was a devil’s food cake. On Friday I Googled and found an image of the autobots sign and blew it up. 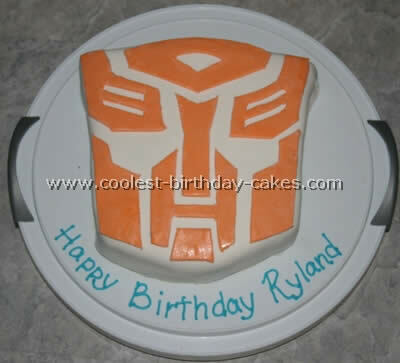 I then took fondant and colored it with food color gel and cut out the autobot sign. Then I wrapped the design in saran wrap and kept it out at room temperature. On Saturday I filled the cake with mascarpone cheese and strawberries that had been macerated in a mixture of lemon zest, lemon juice, vanilla extract and sugar. I then covered the cake in a chocolate buttercream frosting and laid the fondant over and then decorated. 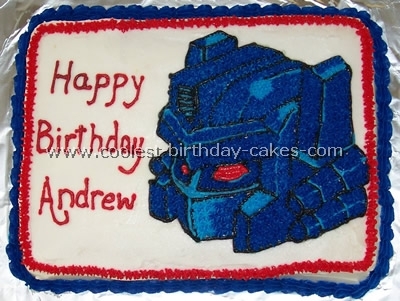 I racked my brain for a fun Transformers cake. I checked out this site and stores for any and all ideas and just couldn’t find anything I loved. I’m just not much of a decorator. But I can cut, inspiration struck the night before my son’s birthday. I searched the internet for a Transformer Decals and found this great site. I chose the decal I wanted, printed it out and then blew it up to the appropriate size. We only needed a small cake so I only blew it up about 35%. Then I printed that out and cut out each piece individually. To make it easier to use as a pattern I then laminated those pieces. I wanted them to be sturdy. Then I baked a 9×13 pan of brownies. We don’t really like cake much in this house and I thought brownies would be easier to cut. I laid my pieces out over my brownie pan; they were just the perfect size to fit all the pieces out of one pan of brownies. I was really careful to use a really sharp knife and removed all the excess pieces first. I was so scared I would break one of my pieces because I didn’t have any leftover brownie to use! 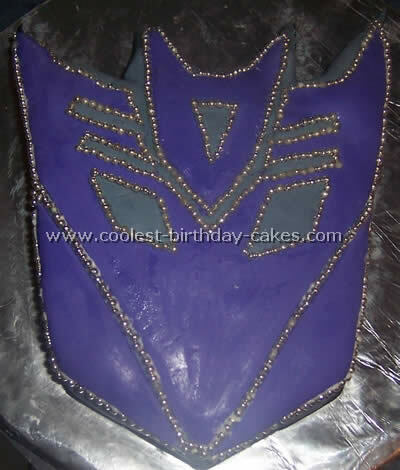 Then I made my background of the Transformers cake. I copied the background from the Wal-Mart transformers cake. I like the flames and free-handed them on cardstock, cut them out and attached them to a sturdy cookie sheet. Then I took a dark piece of cardstock and cut out the outline of my decal and centered it on my cookie sheet. I used that to space my brownie pieces just perfectly. To frost it, I used just a regular tub of pre-made cream cheese frosting divided it into three parts, one bright blue, one bright red and a little bit left white. I had to use a ton of food coloring. We wanted to recreate the blue and red Transformer decal where the face goes from light to dark red and light to dark blue. I frosted each piece individually and tried to blend them with my leftover white to get that same look. It wasn’t perfect but it was good enough. Then I used red and green glitter sprinkles to make the color transitions even more apparent. lots of sprinkles in the dark part and few where the colors get lighter. I made this Transformers cake for my son’s eight birthday. 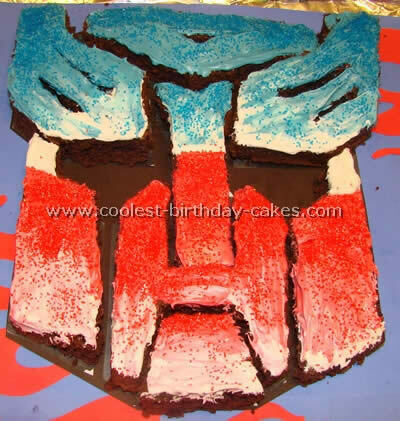 He really wanted a Transformers cake so I found this website (thank goodness I love this site). At the time there were only two cakes on here so I took those two ideas and combined them together (so to speak). I took a 12×18 cake pan and baked the cake. I used vanilla frosting and mixed coloring in it to make the red, blue and grey frosting. As you can see I made half the cake blue and the other half red. I used the grey frosting to do the piping around the edges and down the middle. Now here comes the fun part: the night before I spent about two hours cutting out the Autobot and Decepticon faces out of fondant. I copied the faces onto wax paper which was a little easier to use. I found the Autobots face online, however I couldn’t find the Decepticon. But the figurines on the cake came with little plastic logos so I copied the Decepticon one and blew it up to size. After the faces were done I brushed some silver stuff (in the cake section at the craft store) onto them and let them sit out over night. 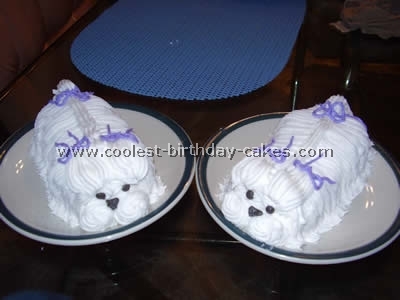 Once I finished baking the cake and icing it the next morning I carefully placed the faces piece by piece on the cake. Put some candles and two toys on and I was done! It was a hit. Everyone loved it especially my son! My brother-in-law loves Transformers and wants me to make him one for his birthday! I was asked by a friend to make an Optimus Prime cake for his birthday. I was up for the challenge. First, I printed off an Optimus prime sketch from the internet then used that as my guide while I carved the shape of his body out. Then, I piped the appropriate colors on his body and flattened them with my finger dipped in cornstarch. I then used fondant dyed in the appropriate colors to make some of the flat panels and the detailed pieces on his face. I used Wilton Pearl Dust on the silver pieces to give them a metallic look. For the flames on his legs I used white fondant to create a flame design and then I painted them red with Wilton No Taste Red food coloring gel. 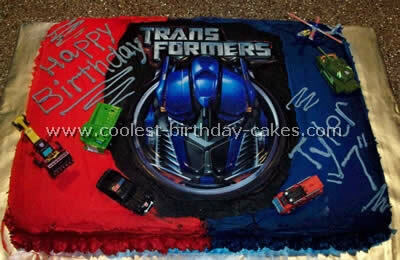 This Transformers cake was challenging but I had fun with it. The birthday boy loved it and it got rave reviews at his party! My son has been obsessed with Transformers since his last birthday. 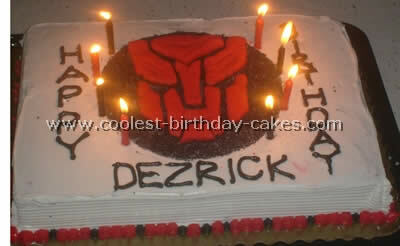 So I knew this year his cake had to be a Transformers cake. I blew up a picture of the deception symbol and cut it out. I then placed it on the cake and cut around it. Then, I iced the entire cake with gray fondant. I cut the picture in to all the different shapes that made up the symbol. I placed each of them on the purple fondant and cut around them. Then I placed all the purple pieces on top of the gray. Finally, I went around every edge and finished it off with some silver sprinkle balls. 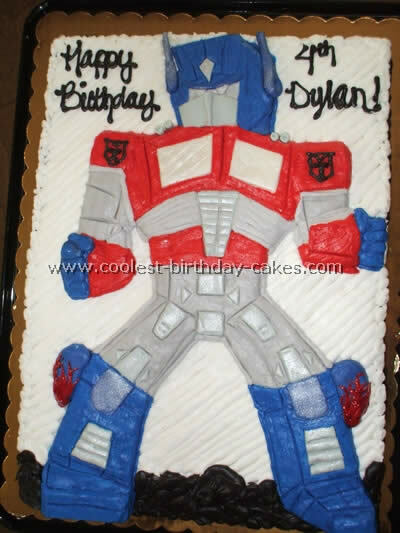 I make cakes mostly for kids so when my friend came to me on a Thursday asking to make a Transformer Cake for her son’s birthday on Sunday I panicked. I explained Wilton hadn’t yet come out with a pan for “Optimus Prime”. She wanted me to put a birthday plate on top of a round cake and call it a day but that’s not my style. I found the cartoon image of the Transformer and mirrored it on my computer. 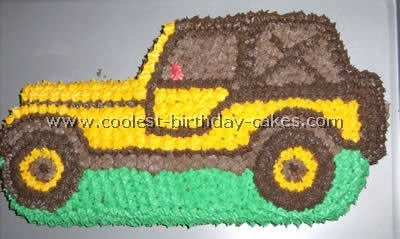 I then outlined the image’s main outlines with piping gel and transferred it to the top of a rectangle cake. From there I just filled in the gaps with the proper colored buttercream. The outline wasn’t too great with the piping gel due to a lot of outlining but it was easier than free-hand drawing it! The kid loved it and so has my other clients! I printed a picture from the Transformers cartoon. I then traced it onto a transparency page with a sharpie pen, flipped it over and used piping gel to trace out the image (on the side I didn’t mark on). 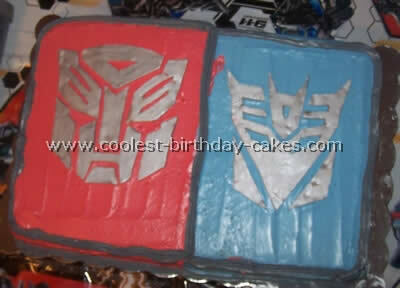 Then I used it as a stencil on the sheet cake to make the Transformers cake. I iced it with buttercream frosting and used Royal Blue (prepared light and dark) No Taste Red and Black Wilton icing tints. I outlined it in black first (3 tip) then I filled in the red for the eyes (3 tip). Then, I put a little bit of light blue frosting in a bag then added dark blue on top of it. Next, I frosted the highlights first (16 tip) then around the highlights until I was using the dark blue to ice the rest of Optimus Prime. I left the stencil at home but I will try to scan it and upload it. 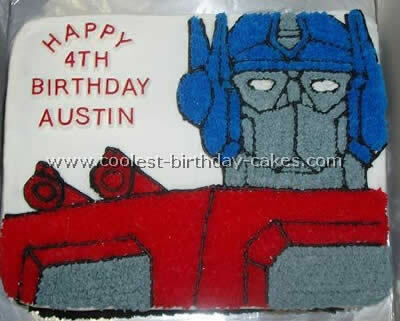 My son wanted a Transformers cake for his birthday, specifically Optimus Prime. I printed a picture of a transformer and enlarged the photo to the size of the cake. After I baked my cake I laid my picture on top of the cake and cut it out. I frosted the cake with fondant. Then I colored the rest orange. I rolled it out and let it harden just a bit. While it hardened I cut out the dark parts of the face and laid them on top of the Orange fondant like a puzzle and used a knife to cut them out. I used frosting to hold the two fondants together. I dyed the inside of the cake blue and the kids loved it. The fondants hides it till you cut in so it is a big surprise for the kids. 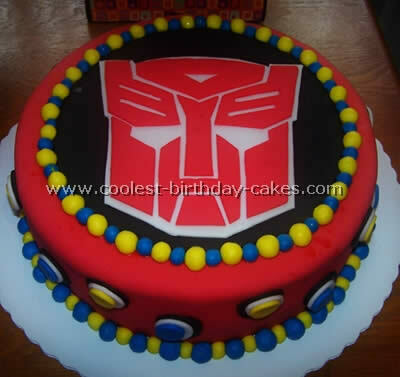 If your son is as crazy about Transformers as mine he will love this Transfromers cake too! I think homemade cakes are so much more special than store-bought character cakes if you have the time and patience! So after thinking about how to make the coolest Transormers cake I could, this is what I came up with. I used the 11x15x2 Wilton cake pan which takes two boxes of cake mix. Bake your favorite flavor according to directions. After the cake cooled I put it on a board wrapped with fancy-foil. I made three batches of the Wilton buttercream frosting recipe leaving some white in case you need more of any color. Then I colored equal amounts of royal blue, no-taste red, black and made a small amount of gray by adding white to a little black. This was for writing “Happy Birthday”. Spread the black frosting in the middle and curve the red and blue frosting around the black on each side. I then used a large star tip with some red (then blue) frosting to put a border around the bottom edge of the cake. All of the kids at the party thought this was the Coolest Cake ever! We had a Transformers themed party with table-cover plates, napkins cups, goody bags stickers and Transformers piñata! Everything was found at local stores except for the piñata which I ordered on Ebay. We topped off the party with a group trip to the new Transformers movie!